Lo Scopettaro (which means the broom shop) is an historic trattoria in the trendy Testaccio district of Rome. It opened in 1930 and legend has it that previously the space was a shop that made brooms for the Pope himself. The story goes that one day, the wife of the broom maker was preparing his lunch in the shop and the delicious aroma wafted into the street. Passers-by kept coming in to ask if they could eat and so the broom shop was turned into a restaurant. So the story goes. The restaurant is in three sections. An outside space, a ground floor area, and a basement dining room. All are furnished with check table cloths straight out of Disney’s Lady and the Tramp. But there’s no cliché here. Lo Scopettaro is the real deal. The menu offers all the traditional Roman fare, pasta all’amatriciana, cacio e pepe, carbonara, gricia, saltimbocca, coda vaccinara, polpette, the list goes on. There is a variety of dishes using offal, as per Roman tradition, including pajata. But there are plenty of other things if that’s not what you are into. That’s not what I’m into and so we started off with polpette alla romana al pomodoro, followed by tonnarelli alla gricia, and then saltimbocca alla romana. The polpette (meatballs) were excellent and probably the best thing I tasted all night. (This, as you will see, is not to demean the other dishes.) They had an immense depth of flavour in which you discerned spices and even raisins. Meatballs can be rather dull tasting and so this was a real treat. Polpette alla romana. You get three. I was too busy eating to take a picture. Tonnarelli alla gricia, (fresh pasta cooked with bacon, pecorino romano cheese, and black pepper) is one of the Roman staples, along with carbonara, all’amatriciana, and cacio e pepe. No Roman meal would be complete without at least one of them. The pasta was perfectly al dente, just how I like it, and the sauce not overly salty, which can be a problem when using pecorino romano cheese. The poor waiter had to come back twice to the table while I was doing the scarpetta (mopping up the sauce with the delicious sourdough bread). Tonnarelli alla gricia one of the most typical Roman dishes. The main course was good. What was even better was the contorno (vegetable side dish) that I ordered: verza e patate ripassata in padella aglio olio peperoncino (pan-fried cabbage and potatoes with garlic, oil, and chilli). It wasn’t as hot as promised on the menu but the garlic was just enough to come through and not overpowering. I could have eaten it as a main course. Saltimbocca alla romana veal with sage and prosciutto in a white wine sauce. Dessert consisted of a mediocre tiramisù. I am such a tiramisù snob that it’s hard to please me though. I rarely order it because it’s something I make at home and also, as it’s a dish from the Veneto, in Rome it always seems a little fuori luogo. The staff were very friendly; typical Roman boys full of banter who served attentively, politely, and at just the right speed. 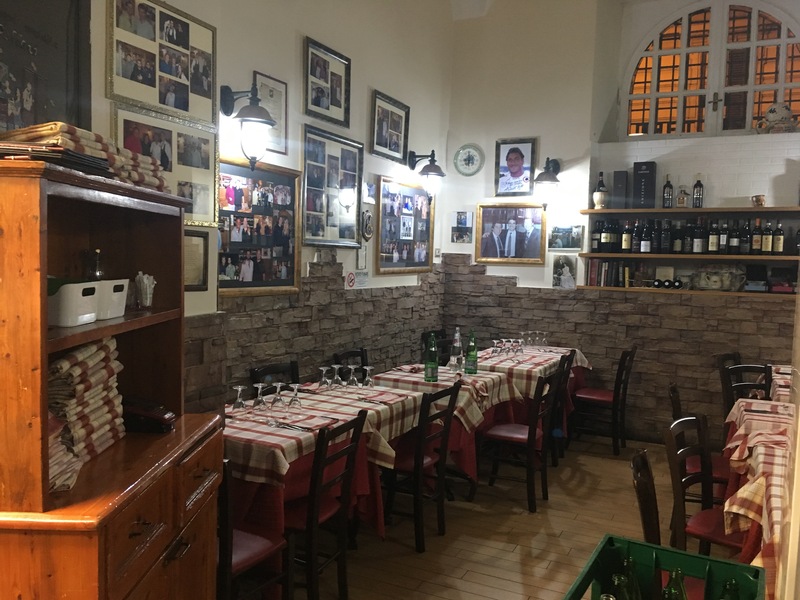 If you want traditional Roman food and atmosphere, Lo scopettaro comes highly recommended. Lo Scopettaro, Longotevere Testaccio, 7, Roma, Lazio, Italy. Open Monday-Sunday 12.30-14.30 and 19.30-22.30. A meal like the one described costs about €35 a head including drinks and service. Ah, it’s very close then. Just a trot up the Via Ostiense, through the walls and then straight on to the lungotevere. A nice walk home to work off your dinner afterwards.